The ceiling on the first floor of the Fairfield Main Public Library. 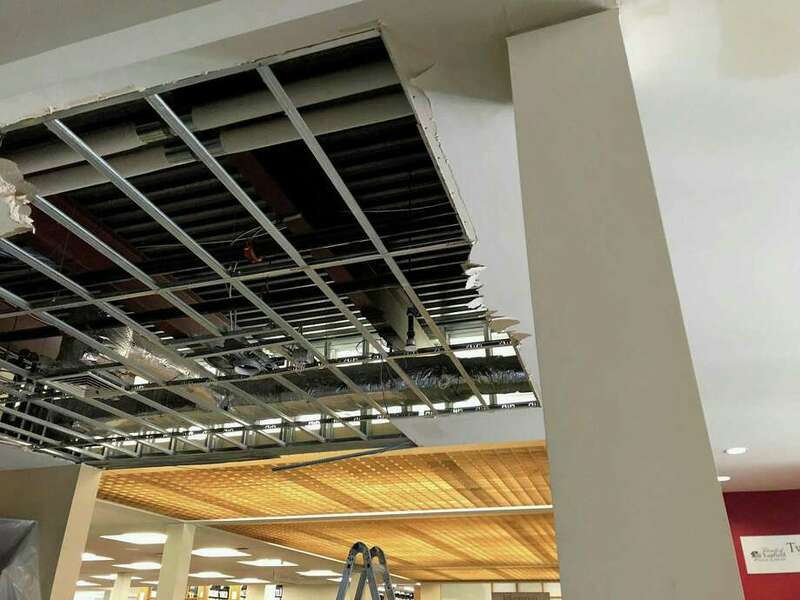 FAIRFIELD — Residents are going to have to wait for the Fairfield Public Main Library to be up and running again, after a pipe burst on the second floor of the building around Thanksgiving Day. A visit to the library this week saw workers pulling out moist sheetrock and wet ceiling parts on the first floor. Monitors and books were covered up with plastic sheets. A library employee said water damage had affected the art area, the carpets and sheetrock on the basement, first and second floors. Emmet Hibson, the human resources director and also purveyor of risk management, said the town was expecting the scope and the cost of the repairs to be known by this week. Hibson said CIRMA would review the quotes to determine the cost of repairs to the library. “If the town accepts CIRMA’s scope, CIRMA will authorize and pay for the repair and invoice the town for the first $100,000,” Hibson said. The Fairfield Woods Branch Library and Pequot Library remain open to the public.